Zachary Randolph was born on the 16th July 1981 in Marion, Indiana USA. He is a basketball player, the member of the Memphis Grizzlies team, in the NBA. He earned the title of the Most Improved Player in 2004, All-NBA Third Team in 2011, and NBA All-Star in 2010 and 2013. Randolph has a good shot of average distance. Moreover, he is a good rebounder. Zach has the capacity to average 20 points and 10 rebounds per season. Zach Randolph is the type of player with a great talent, even with upgradable physical qualities for the position in which he plays. Randolph has been playing basketball professionally since 2001. How rich is the player? It has been estimated by authoritative resources that the overall size of Zach Randolph’s net worth is as much as $65 million, as of the data given in mid-2016. To add more, this figure is likely to rise as the player earns $16.5 million per year. Firstly, Randolph attended Marion High School, where he was coached by Moe Smedley. Later, he was coached by Craig Moore, who soon saw the great potential of the boy. As a senior, he was second in the Mr. Basketball of Indiana voting, only surpassed by Jared Jeffries. Afterwards, he became a part of the Michigan State Spartans, in one of the most famous universities in the USA, coached by Tom Izzo. Among his fellow students there were also Charlie Bell and Jason Richardson. Concerning his professional career, Randolph was chosen the 19th overall in the first round of the NBA Draft 2001 by the Portland Trail Blazers. He plays in the position of power forward. In the 2006 – 2007 season he went on the score sheet with an average of 23.6 points and 10.1 rebounds. Unfortunately, he was forced to curtail his season because of a bad injury in March. In June 2007, having averaged 16 points and 7.7 rebounds per game during his time with the Trail Blazers, Randolph along with Dan Dickau, Fred Jones and Demetris Nichols was traded to the New York Knicks in exchange for Steve Francis, Channing Frye and a second pick in the draft. Then at the end of 2008, he was involved in a trade that brought him to the Los Angeles Clippers. The agreement with teammates, including Baron Davis, was quite good, but the Clippers failed even to qualify for the playoffs. During a game against the Phoenix Suns, Randolph was expelled and later disqualified for throwing a punch to the jaw of his rival Lou Amundson. 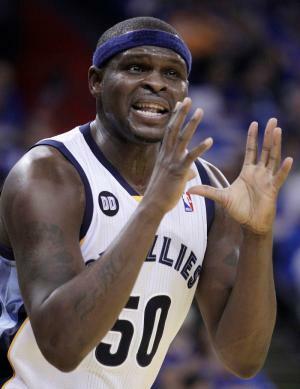 However, his average remained consistently above 20 points and 10 rebounds per game, but in the middle of 2009, Zach Randolph was traded to the Memphis Grizzlies in exchange for Quentin Richardson. This season he recorded an average of 21 points and 11 rebounds per game, figures that earned him selection to his first All-Star Game in his career. The second time he became an All-Star was in 2013. Finally, in the personal life of the basketball player, Zach is married to his long time girlfriend Faune, and they have three children. Currently, the family resides in East Memphis, Tennessee.